The good guys — companies that are good to employees, to customers and to their communities — keep winning. That’s the hopeful news we found as we compiled the latest Good Company Index report. The Good Company Index (GCI) assesses companies on their performance as employers, sellers and as stewards of the planet and communities. 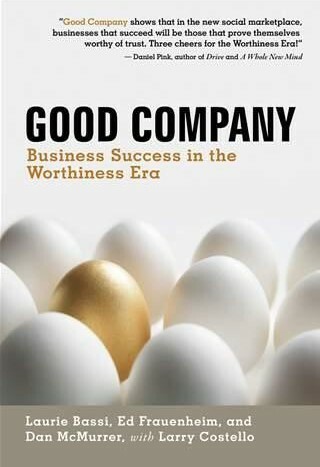 We created the original GCI metric as a feature of our book Good Company: Business Success in the Worthiness Era. This year represents the third year in which we’ve calculated Good Company grades for many of the largest companies in the United States, and we have a new set of companies at the top of the rankings. We also check in once again with the grades we assigned in previous years to see how good companies did relative to their not-so-good competitors in the stock market. The quick answer: Pretty darn well. Among the Fortune 100, the 2014 GCI crowns three new leaders: Apple, Ford Motor, and United Parcel Service (UPS), each of which earned a full grade of B+. The highest-ranked company in 2012, Time Warner, fell significantly, to a grade of C. Time Warner had mediocre ratings as a seller and a steward of the environment this year. Only Apple achieved a score of B+ or higher in both 2012 and 2014. As we mentioned two years ago, Apple is a complex case. We continue to find ourselves troubled with the company’s high rating as an employer given reports of less-than-decent treatment of Apple’s extended workforce in overseas factories run by partners. Unfortunately, we do not know of any reliable, comprehensive source of data on companies’ outsourced workers. Absent such information, our employer score necessarily relies solely on the enthusiasm direct employees have for Apple, as reflected in Apple’s excellent scores at employee feedback site Glassdoor.com. Two companies stand out for their consistently good performance over all three years of our Good Company Index grades: Intel and UPS. Among the Fortune 100 companies graded in 2011, those are the only two companies that have achieved grades of at least a solid B in 2011, 2012, and again in 2014. 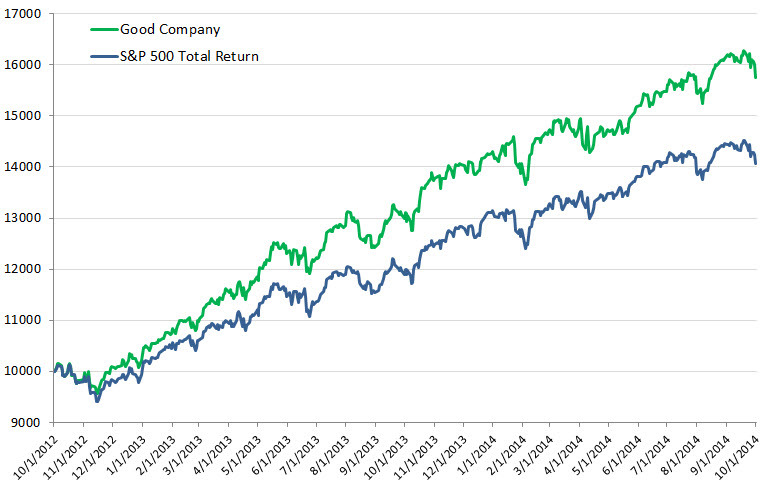 We also looked closely at the stock market performance of companies to which we assigned grades previously. In particular, we’re looking to see whether companies with better grades later outperformed those with lower grades, which would indicate that the characteristics we’re capturing in the Good Company Index are associated with better overall performance. Our previous analyses strongly supported the conclusion that good companies are also more successful relative to their peers, and the latest results again support that finding. Because we know multiple external factors can affect stock prices, we seek to minimize the influence of those factors in our analyses whenever possible. In particular, we attempt to examine companies’ stock performance relative to comparable organizations to help control for industry-related factors that can have a significant effect on the stocks of all companies in a given industry. This year we examined the two-year stock performance of all 50 “industry-matched pairs” (two companies in the same industry) in which the companies’ 2012 Good Company grades differed by one or more full grade levels (for example, a grade of B versus a grade of C) for companies with full grades, and by two or more full letter grades for companies with quick grades (due to the much smaller number of factors included in quick grades). We found that, on average, those companies with higher 2012 Good Company grades significantly outperformed their matched competitors over the next two years by almost every measure we examined. The median outperformance was 5.1 percentage points and almost 60 percent of the higher-ranked companies outperformed their lower-ranked competitors. 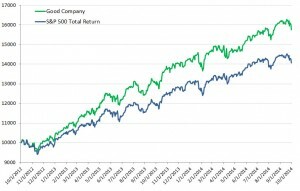 Further, a live portfolio comprised of the top-scoring companies on the 2012 GCI, invested since October 2012, has outperformed the benchmark S&P 500 average (total return, including dividends) by 17 percentage points as of October 1, 2014 (see Figure 1 below). Our analytic findings have been buttressed by external research that has also found strong evidence that higher scores on specific GCI components are associated with better stock performance. For example, a 2012 analysis by the Boston Consulting Group found that companies on the Fortune “100 Best Companies to Work For” list at least three times in 10 years outperformed the market by 99 percentage points over a 10-year period. And the wRatings data that we use as a base for our seller scores have also been incorporated into a “Customer Value Index” that has been used to significantly outperform the stock market as well. To be sure, the Worthiness Era we described in our book three years ago has not yet come to full fruition. We see plenty of bad behavior by companies large and small. But year after year, other, positive, data points are adding up. The 2014 Good Company Index Report, with its good news that the nice guys are in the lead, is the latest sign that a more hopeful age is taking shape. Ed Frauenheim is an editor at Great Rated!™, the workplace research site that gives job seekers the inside scoop on companies and their cultures so they can find their best fit. ?Ed produces content for Great Rated! and for its parent organization Great Place to Work®. Ed has been writing about work, business and technology for 15 years, including eight years as a reporter and editor at Workforce magazine. He is also co-author of two books: "Good Company: Business Success in the Worthiness Era," and "Organized Innovation: A Blueprint for Renewing America’s Prosperity." Contact him at ed.frauenheim@greatplacetowork.com. Laurie Bassi is the CEO of McBassi & Company, a leader in the emerging decision-science of human capital management. Since founding McBassi in 2001, she has been working with clients to help them unleash human capability within their organizations. Earlier, she served as VP for research at ASTD, the director of several U.S. government commissions, and a tenured professor of economics and public policy at Georgetown University. Contact her at lbassi@mcbassi.com.